Are you tired of losing track of login/usernames and passwords you must create every time you visit a new website? Do you have sticky notes and scraps of paper scattered about your office and home computer space covered with these vital pieces of information, but never seem to be able to put your hands on them when you need them? Now you can keep important website addresses, usernames, and passwords in one convenient place! 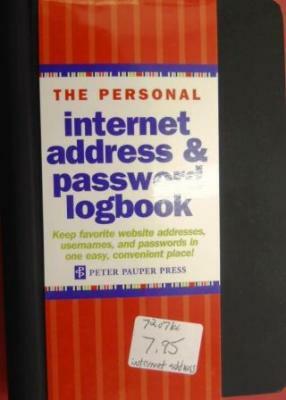 The Personal Internet Address & Password Organizer has 145 pages, including tabbed alphabetical pages. Plenty of room to fill in website addresses, usernames, passwords, and add notes. Spiral binding allows pages to lie flat. Elastic band closure. Includes pages in the back to record additional useful information, such as your home network configuration, software license numbers, and other notes. Removable band and discreet cover design. This was our bestselling item for Christmas: it's a fantastic stocking stuffer! A wonderful item to keep near the counter for last-minute spontaneous sales, because almost everyone who looks at it comments on how they need one, or someone in their life needs one.